Don't look now but there's a gigantic spider on your floor mat! 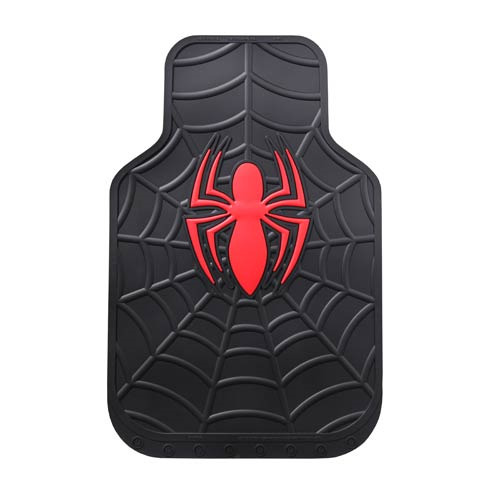 Order this fantastic Spider-Man Marvel Black Rubber Floor Mat 2-Pack featuring a large red spider design against a black web background. Your car or truck will thank you! These floor mats are universal fit and ultra-durable. Sold as a pair, they measure approximately 26-inches tall x approximately 17-inches wide. Molded from the highest quality materials for long-lasting wear. Easily cleans with soap and water. Vibrant, molded in colors, that will not fade. Made in the U.S.A. Ages 16 and up.